Join us for the second annual Camp Sweetwater at the gorgeous Sweetwater Floral in Petoskey, Michigan. The day will be filled with relaxing, meeting new friends, spending time outside on a beautiful lavender farm, eating delicious food, and learning new skills. I will be teaching the basics of watercolor painting, and will be sharing some of my favorite tips, tricks, and tools to use. Each guest will go home with a handmade piece of art. Absolutely no experience is necessary to enjoy this class. There will also be a some of my favorite girl-bosses in the industry teaching their art. Meaghan Keck of Birch Affair will be teaching how to make paper flowers, and The Leelanau Plant Company will be teaching how to create a beautiful succulent arrangement. To get all of the juicy details and to snag your ticket, follow the link below! Our Venue | Join us at The Loft at Luna in vibrant downtown Grand Rapids, Michigan! This loft space features brick walls, exposed beams, views of the city, and a perfectly warm setting for our time creating together. Pop the bubbly...it's the holiday season! Join us for our half day workshop, just a few days before Thanksgiving, to get into the holiday spirit! Spend a few hours creating beauty together, while learning new skills or honing old ones, this one-of-a-kind La Petite Bloom Workshop is meant to give you tons of inspiration with hands-on learning. We are thrilled to welcome back Jennifer Haf of Bloom Floral Design, who will be demonstrating a holiday flower arrangement, then helping YOU create your very own, just in time to grace your Thanksgiving tablescape. You will learn hosting tips and have a few different table setting demonstrations, along with inspiration + DIY ideas to make your holiday table shine. In our second hands-on session, you will try your hand at calligraphy and hand lettering with Kristin Hussey of Sable & Gray. After practicing your lettering, you'll have time to make custom gift tags for your family and friends for the upcoming season of giving. Whether you are a creative industry professional or in a different industry altogether but have a desire to use your creative talents, we want to welcome you to our first Holiday Hosting workshop. You're sure to leave with a gorgeous centerpiece, calligraphy supplies, gift tags, newfound ideas + inspiration, as well as some sweet new friends! Cost | Tickets are $199 or $359 for two tickets. Beautiful floral arrangement and vessel from the hands-on flower arranging session. Calligraphy supplies and gift tags from the hands-on calligraphy session. Teachers' knowledge and assistance during hands-on sessions. Our teachers make it to each student to be sure they are successfully creating! Lots of inspiration through the holiday tablescape inspiration session, including a demonstration on different ways to set your table, hosting tips and tricks, place card ideas, and more. We're known to surprise our guests at La Petite workshops with a small gift! Teachers | learn about our talented floral and calligraphy teachers who will be teaching you at Holiday Hosting! 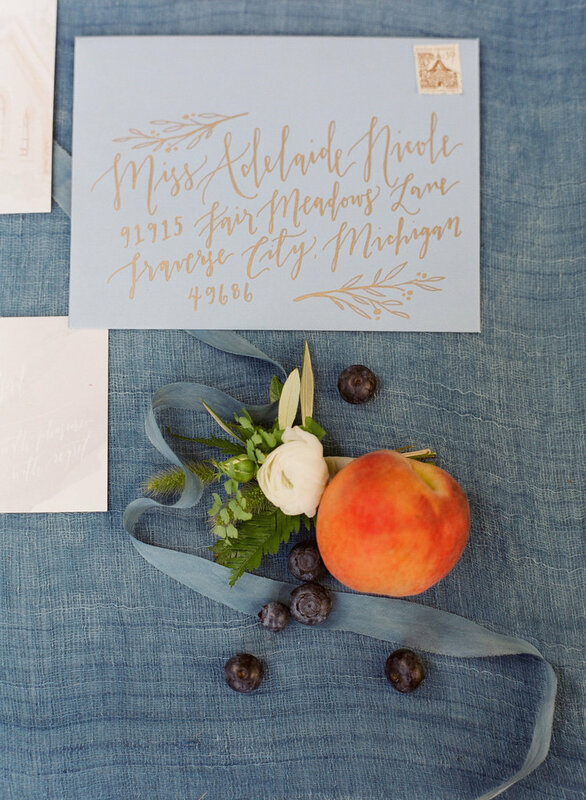 Sable & Gray is a stationery and paper goods company located in Traverse City, Michigan. 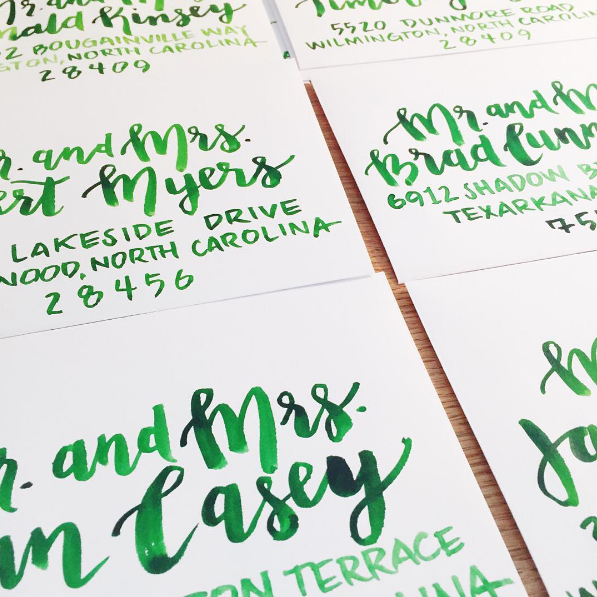 They specialize in custom wedding invitations featuring hand-painted watercolors and hand-drawn designs. We find the inspiration for our designs in everything from the bride's bouquet to the architectural details of her ceremony location. We are excited to have Kristin teaching a watercolor calligraphy session at our Holiday Hosting workshop, complete with demos, practice sketches, all your supplies, and ample time to practice illustration and lettering. Guests will finish this session by making gift tags for their loved ones, in preparation for the upcoming season of gifting! Bloom believes that flowers are most beautiful in their natural state. When combined with other blooms in a customized palette, color and texture create a distinctive design that exudes the feeling you wish to create. BLOOM sources flowers from only the finest growers, sourcing as many flowers as possible locally and domestically including our own specialty cutting gardens. We are welcoming Jennifer back to teach the floral arranging class of our holiday workshop, where guests will get to see a live demo, choose their blooms at our flower bar, then create their very own Thanksgiving Day centerpiece. The arrangement will be in a neutral palette, featuring whites, greens, blush and peach flowers. Acquire the foundation of traditional calligraphy using a brush calligraphy pen and then translate those concepts to modern hand-lettering. Learn the proper techniques for writing the traditional calligraphy forms, how to practice those basic shapes, and how to then apply those techniques to writing the alphabet. Use your new skills to create beautiful hand-lettered designs using any pen, pencil, or paintbrush. Go home with a hand-crafted item featuring your hand-lettered design and the confidence to develop your own hand-lettering style. All materials supplied. NMC | Great Lakes Campus Rm. 103. Our Venue | The historic and quaint Old Art Building in Leland, Michigan just 20 minutes from Traverse City and steps away from Leland "fishtown" in the heart of Northern Michigan wine country. La Petite Bloom is a half day, miniature workshop that allows attendees to try their hand at specific skills and stretch their creativity. This workshop will feature a floral arranging session led by Jennifer of Bloom Floral Design and a calligraphy session led by Kristin of Sable and Gray. While no skill is required to attend, our teachers will offer extra tips and advice for seasoned attendees looking to tweak their craft as well. The flower bar where guests get to choose their blooms for the arrangement has been one of The Bloom Workshops most highly anticipated sessions and we are excited to be offering it at this event. This workshop is a great day for networking with others in your creative field, inspiration and simply having fun! We welcome all levels of skills. Guests will walk away with the basic knowledge of how to design and execute a petite table arrangement. Information on how to create a flower recipe, how to build your arrangement in a proper vessel, and expert tips will be shared. Each guest will have time to choose blooms from a gorgeous flower bar, dripping with blooms. Ample time to build your arrangement with hands-on instruction will be available for every attendee. 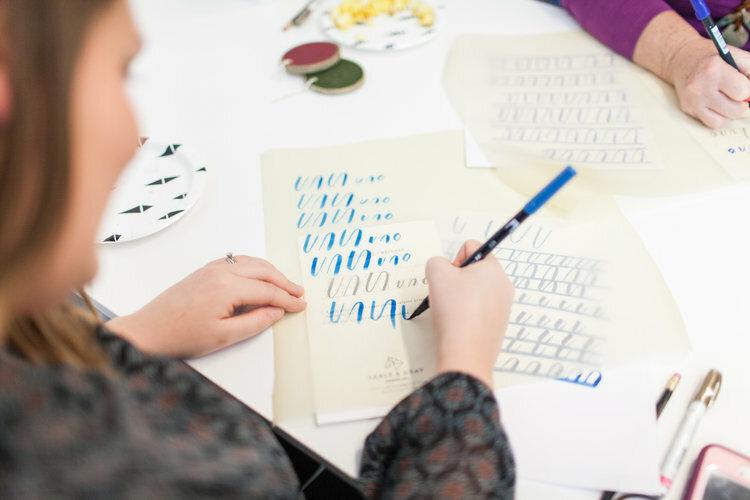 Each attendee will receive a calligraphy kit to use for the hand lettering session which will be theirs to take home. Calligraphy kits include watercolor brushes, paper, instructional materials and paints. Ashley Slater Photography + Michaela Noelle Designs lead a session on photo and styling tips. Attendees will have the opportunity to utilize what they learned in this session by styling and photographing their new calligraphy and floral artwork with hands-on help. Editing apps, best light, principles of design and more will be shared! Headshots by Ashley Slater Photography will be provided for each attendee. Networking and access to The Bloom Workshop Network after the workshop ends. Future discounts on all workshops and products as a Bloom Alum! 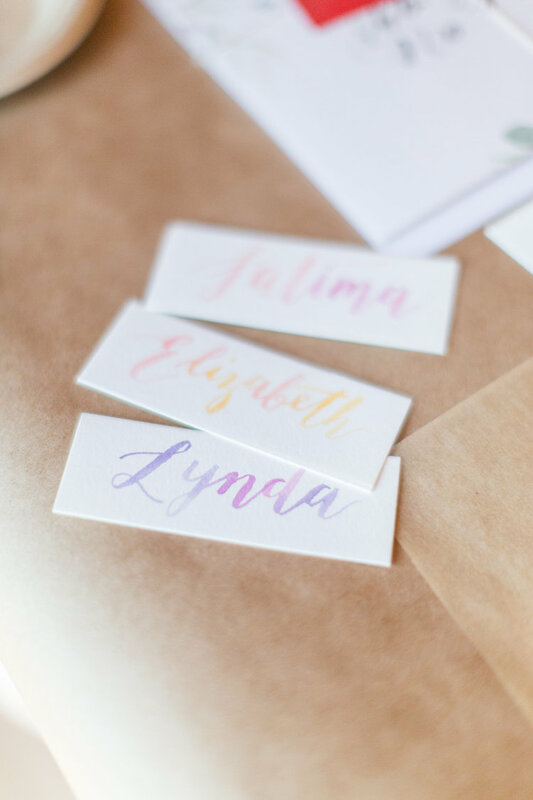 We are excited to have Kristin teaching a watercolor calligraphy session at this La Petite Bloom, complete with demos, floral sketches for you to paint in with watercolor, all your supplies, and ample time to practice illustration and lettering. Ashley has been a storyteller from a young age. When she discovered photography, she discovered how to tell stories in an incredibly stunning way and was hooked. Based in the midwest, Ashley is primarily a wedding and portrait photographer and loves shooting with her film camera as much as possible. When she is not photographing weddings or running the Bloom Workshop which she co-founded, you can find her at home with her husband and two small boys. She is a wine and food enthusiast and enjoys traveling, cooking, eating and exploring new cities. Ashley will be giving photo tips and tricks, as well as teaching attendees how to take and edit the best possible photos on their phones. She will also be taking each guest's headshot! Bloom believes that flowers are most beautiful in their natural state. When combined with other blooms in a customized palette, color and texture create a distinctive design that exudes the feeling you wish to create. BLOOM sources flowers from only the finest growers, sourcing as many flowers as possible locally and domestically including our own specialty cutting gardens. Hand selected from the most exceptional varieties, our blooms will be sure to please. We are welcoming Jennifer back to teach the floral arranging class of our workshop, where guests will get to see a live demo, choose their blooms at our flower bar, then create their own petite arrangement. Michaela has always had a passion for interior design, as she grew up building floor plans out of jenga blocks, spanning the entire width of her bedroom.Her passion for design has always been a part of her life, so with a love for houses and design, Michaela graduated with a Bachelor’s degree in interior design from Seattle Pacific University and an AA degree in interior design from the Fashion Institute of Design and Merchandising. She has been authoring her design and lifestyle blog since 2010 and launched her own interior design business upon graduating, where she enjoys serving people and families by creating homes they love. Michaela will be sharing styling tips and tricks to help guests improve their branding or refine their designer eye. After the overwhelming response to our first four Hand-Lettering Workshop we've added a fifth (and FINAL!) workshop to the series! Do you live in Michigan? Do you love donuts, wine, meeting new friends, and making pretty things? Then you've come to the right place! Join us for a Hand-Lettering Workshop on Tuesday, March 14 at 6:00pm at the adorable new Empireblu location in Traverse City, Michigan. I will be in touch one week before the class to finalize any details. All tools needed for the class will be provided. The class will last roughly 2 hours, and light snacks & refreshments will be provided. Wish there were still seats left? Sign up for our email list and be the first to know about any future workshops. After the overwhelming response to our first three Hand-Lettering Workshop (which all sold out in just a few hours!) we've added a fourth workshop to the series! Do you live in Michigan? Do you love donuts, wine, meeting new friends, and making pretty things? Then you've come to the right place! Join us for a Valentine Hand-Lettering Workshop on Tuesday, February 7th at 6:00pm at the adorable Vintage Vanity in Suttons Bay, Michigan. I'll be teaching the basics of how to hand-letter, what my favorite tools are, and how to use your new skills to make fabulous, one-of-a-kind gifts just in time for Valentine's Day! Absolutely NO experience necessary to enjoy this class. Each guest will go home with a hand-made Valentine gift, a hand-lettering basics guide, and my favorite pen so you can continue this new hand-lettering journey at home. 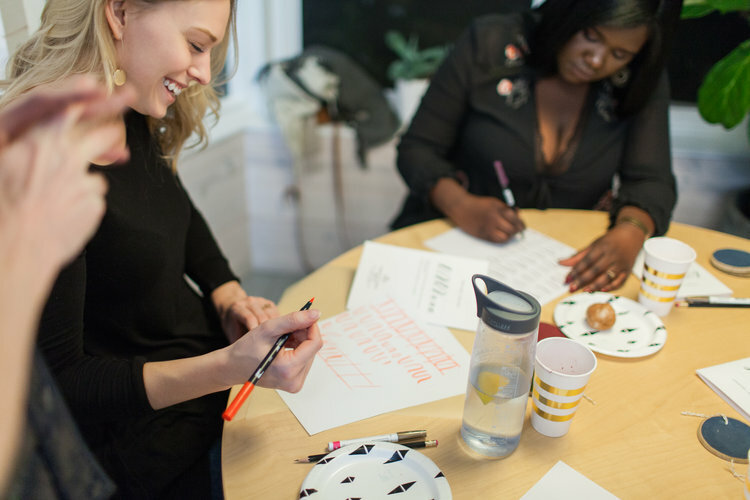 After the overwhelming response to our first two Hand-Lettering Workshop (which both sold out in just a few hours!) we've added a third workshop to the series! Do you live in Michigan? Do you love donuts, wine, meeting new friends, and making pretty things? Then you've come to the right place! Join us for a Valentine Hand-Lettering Workshop on Tuesday, January 31st (not New Year's Eve ;) ) at 6:30pm in the Studio Smiths building in downtown Traverse City. Thank you guys for your overwhelming support again! You're the best! Do you live in Michigan? Do you love donuts, wine, meeting new friends, and making pretty things? Then you've come to the right place! Join us for a Holiday Hand-Lettering Workshop on Thursday, November 17 at 6:30pm in the Studio Smiths building in downtown Traverse City. I'll be teaching the basics of how to hand-letter, what my favorite tools are, and how to use your new skills to make fabulous, one-of-a-kind gifts just in time for the holidays! Absolutely NO experience necessary to enjoy this class. Each guest will go home with a hand-made holiday gift, a hand-lettering basics guide, and my favorite pen so you can continue this new hand-lettering journey at home. Woo! Thank you guys for your overwhelming support for our first hand-lettering workshop! We promise to add more workshop dates soon. Wish there were seats left? We promise not to fill up your inbox... we hate spam too. Thank you! We'll be in touch to let you know of any new workshops!